The World's finest roses, easy to care for perennial plants, garden tools, accents and more, only from the Jackson and Perkins catalog. Roses - Everything is coming up roses at Jackson & Perkins, your home for the highest-quality roses available for your garden and patio. For over a century, they have been counted on to deliver the newest introductions, most cherished favorites, and exclusive varieties that you won't find anywhere else. Enter the promo code - FABJP - at checkout on the Jackson & Perkins website. From hybrid tea roses to miniature sized blossoms, floribundas to climbing and shrub roses, you'll find the loveliest and most fragrant species to choose from, with endless options that will allow you to lavish your landscapes with ease. Plants - The Jackson and Perkins catalog is every gardener's go-to source for the best selection of easy to care for plants that will fill your garden with beauty and growth for weeks, months, and years to come. You'll find a diverse selection of sun and shade perennials, colorful flowering shrubs, tasty edibles, trees and evergreens, vines and climbers, and even more high-quality plants and perennials that will bring color, fragrance and charm to your garden, patio or backyard. For the Garden - Tend to your garden like a pro with all of the essentials tools, accessories and accents you need stocked in your shed throughout the seasons. From planters and watering accessories to gardening gloves, aprons, raised garden beds and storage solutions, your garden has never been in better hands. 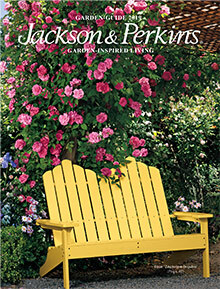 Shop with Catalogs.com's exclusive Jackson and Perkins coupons to save more on every purchase. Outdoor Living - Enhance and adorn every inch and acre of your outdoor living spaces with a versatile collection of garden accents and outdoor decor. You'll find long lasting and weather withstanding garden furniture including patio dining sets, chairs and benches as well as decorative arbors, pergolas, pillars and trellises, outdoor lighting, fountains, and a variety of enchanting garden accents that will add the finishing touch to your outdoor oasis. Holiday Trees, Evergreens & Gifts - Gear up for the holidays with a festive selection of seasonal decor and gifts that will help you spread mirth and joy while celebrating the natural beauty of the season. You'll find an assortment of pre decorated holiday trees for every corner as well as fresh and fragrant Evergreen wreaths, swags, garlands and centerpieces to winterize your home. From potted Amaryllis and Poinsettia gifts to ornaments and Evergreens, you'll find a garden of flowering gifts to shower your loved ones with during the holidays, and all year round. Since 1872, Jackson & Perkins has provided gardeners across the country with a premium selection of garden accents, tools and essentials, as well as Award winning roses and plants that are guaranteed to grow.